"Hello World!" 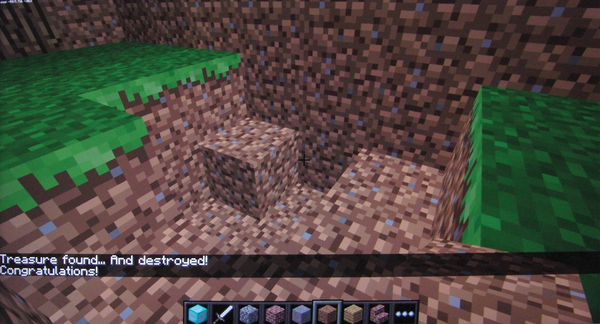 programs are dumb, so you're going to dive right in and make a game within Minecraft – call it Treasure Hunt. The aim of the game is to find (and demolish!) a diamond block that has been hidden (buried) somewhere in the Minecraft world. Every 10 seconds, the program will post "Colder!" or "Warmer!" to the chat screen, depending on whether you are farther from or closer to the hidden block than the last time you checked (see the game program in Listing 1). Line 1 loads several standard Python modules you'll need later on. With the random module, you'll pick a place to hide the treasure; math comes with methods like sqrt (square root) and pow (power) that you'll need to calculate the distance from the player to the treasure. Finally, you'll need time to post messages every 10 seconds. Lines 3 and 4 import Minecraft-specific modules. The block module allows you to manipulate blocks, and the minecraft module allows you to know the player's position, to print messages to the chat window, and so forth. Line 5 creates a connection to the running Minecraft server. Lines 3 to 5 will be pretty standard in all the Minecraft programs you write. After loading all the necessary modules, the first thing you have to do is hide the treasure. The Pi version of Minecraft is 256 blocks wide on the x axis and 256 blocks deep on the z axis. Position (0,0) is the center of the grid. The y axis is up/down. I haven't been able to find the upper limit for the y axis, but 0 is sea level, which will be important later. To keep things safe, the program will place the treasure within a square area that has 251 squares on a side (line 10). Even though you're avoiding the extreme edges (Minecraft Pi sometimes crashes when you play too close to the limits of the world), you still have a playing field of 63,001 blocks, and the treasure can be anywhere … or almost. To avoid burying the treasure under the sea (because that would be evil), you check to make sure the highest point of the chosen location is above sea level (lines 9 to 11) with getHeight(), which is part of the Minecraft API. So that the diamond is not immediately visible, you push it two layers under the surface (line 13). The setBlock method used in this instruction is part of the Minecraft API (Table 2) and takes the x, y, z position of the block you want to modify, plus the type of block you want to transform it into. For a full list of the types of blocks you can use, check out the Minecraft: Pi Edition wiki . An unexpected effect of the code as described is that the diamond is not only underground but can also be hidden under a tree. Because this adds a little more challenge to the game, I decided to leave it as is. Just change the trailing x, for y or z to get the corresponding components of the player's coordinates. This, by the way, is called dot notation. You will have learned from geometry that the way to calculate a distance between two points (your player and the diamond) on a grid is by using the Pythagorean theorem (Figure 2). The difference between mc.player.getTilePos().x and tx is the length of one of the legs of a right triangle and the difference between mc.player.getTilePos().z and tz is the length of the other leg. The hypotenuse of your imaginary triangle is the distance between the two points: In Python, that calculation looks like line 15. 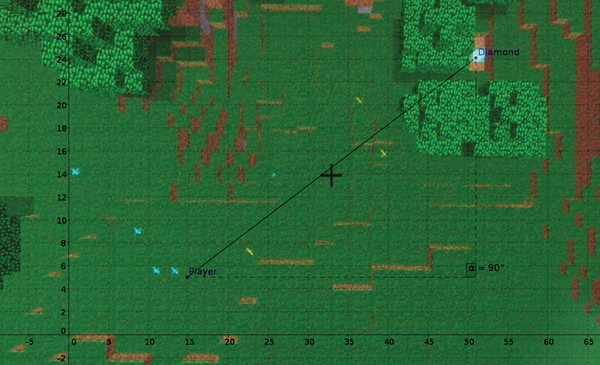 Figure 2: Using the Pythagorean theorem, you can calculate the distance from the player to the diamond. 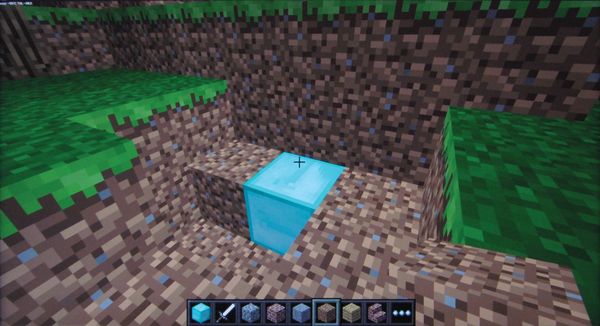 The aim of the game is to locate and destroy the diamond, so now you create a loop that uses the Minecraft method getBlock() to check the content of the diamond's location (line 17). As soon as the location contains air (i.e., 0, which is the numeric value for a block of type AIR ), the diamond has been destroyed and the loop will exit. Meanwhile, you must check the player position every 10 seconds to see if it is any closer to or farther from the treasure (lines 21-24). 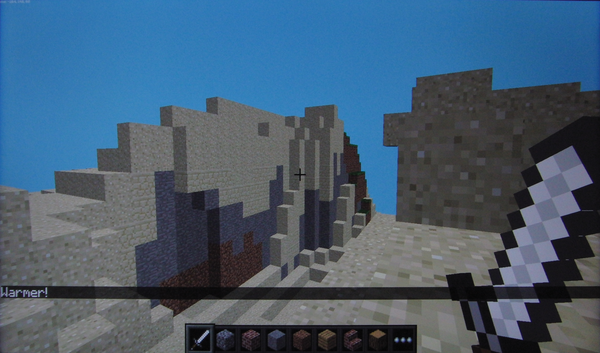 If the distance is 0 (i.e., the player has arrived at the correct location), the program uses the postToChat() Minecraft method to show a Dig! message in the chat window. If the distance has decreased since the last time you checked, you post Warmer! (Figure 3); if it has increased (i.e., the player has moved farther away from the goal), you'll post Colder!. If the distance hasn't changed, you can assume the player hasn't moved and you post the incentive Move!. Figure 3: Messages in the chat window guide the player toward the treasure. The new distance becomes the old distance (line 26), then the program waits for 10 seconds (line 28) for the player to move, and the cycle starts again. As soon as the player locates (Figure 4) and destroys the diamond, the loop exits, and the program congratulates the player (Figure 5) and ends. Figure 4: You found the treasure. Now smash it to bits! Figure 5: The program congratulates you on your successful quest.